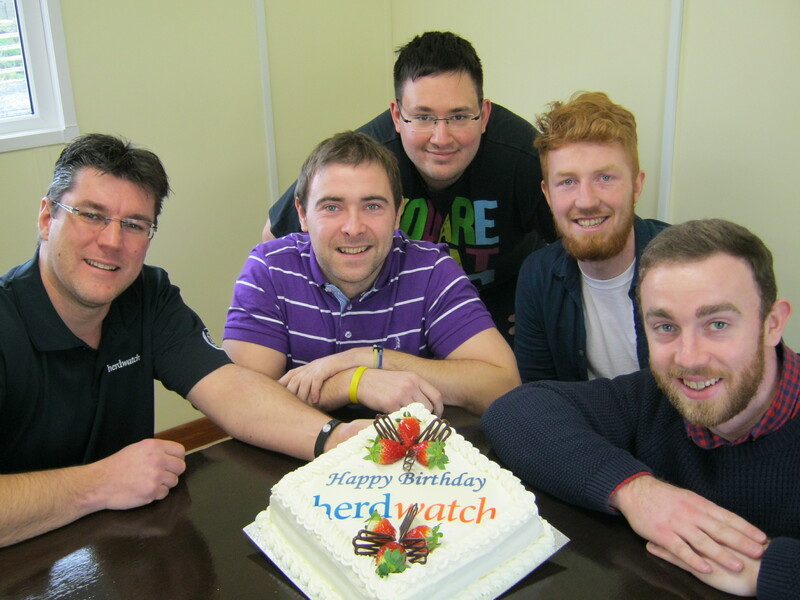 Reaching its second birthday is an important milestone for Herdwatch. It has put a new twist on technology and the way farmers register their calves and manage their herd and farm compliance. Fabien expects the future to be promising. “I’m looking forward to reaching big milestones such as 5,000 users in the next few months. Launching in the UK is also a big milestone. I can’t see any reason why in the next 3 to 5 years we wouldn’t have tens of thousands of farmers on Herdwatch in Ireland, the UK and other markets”. A free trial of Herdwatch is available on www.herdwatch.ie. Recent figures from the Health and Safety Authority (HSA) show that fatalities in agriculture were down 40% on 2014. 18 deaths were reported in 2015 in comparison to 30 in 2014. For the sixth year in a row, figures show that agriculture holds the record for the highest number of fatalities above all other sectors. In 2015, 55 people were killed in work related accidents, which the HSA stated is exactly the same number as 2014. Across all sectors, incidents involving vehicles were the main cause of fatal accidents in the workplace, 21 in total, according to the HSA. A tractor or machinery were involved in six farm fatalities and four were involving livestock. Construction fatalities increased from eight in 2014 to 11 in 2015 along with this the fishing sector saw an increase from one in 2015 to five in 2015. Two-thirds of work related deaths, occurred in businesses with fewer than 10 employees, mainly in agriculture, construction and fishing. In 2015, there were four child fatalities, all of which were agriculture related. FRS are firm believers in promoting Farm safety and throughout 2015 worked hard to deliver live farm safety demonstrations to the public. 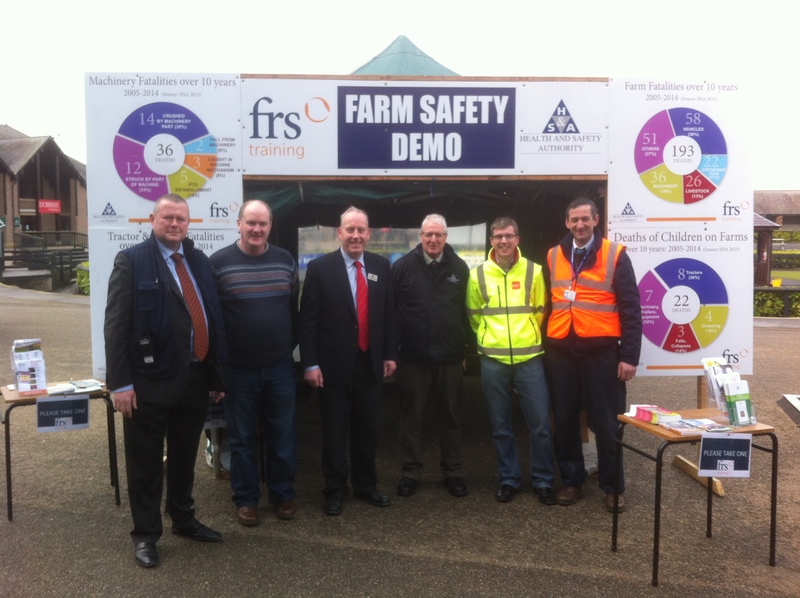 FRS teamed up with FBD and the HSA to showcase practical farm safety demonstrations at the various agricultural shows throughout Ireland. These included safe handling of bulls and livestock, Tractor PTO demonstrations, as well as giving general farm safety advice.The demonstrations proved to entice the crowds and this year will expectantly prove no different. What would you do if you had a farm accident and could not run your farm tomorrow? The FRS Membership Benefit Scheme has helped many farmers out at their most vulnerable time – when they were unable to work their farms. FRS offers a unique benefit as it arranges a relief worker straight to the farm to cover the work in the event of any accidents or sickness that is supported by a doctor’s cert. The Sickness and Accident Support entitles members to the services of an experienced FRS operator for up to *12 weeks at only 25% of the regular cost (75% off). Maximum benefit is €500 (incl. Vat) per week (*first week is excluded and must be paid by the member).The feedback from farmers who have claimed under the sickness and accident support reinforced to us the importance of offering this benefit to the industry. The savings that these farmers made on their labour needs was just one side of it. The more significant side being that they could concentrate on recovering knowing that their farms were being looked after. Having a good trained reliable operator ready to step in, when required, is what the farmer needs and that is what FRS is all about. The membership also gives better value farm services rates with top priority given to members and a death and capital benefit of up to €20,000. Membership costs €295 annually – that is Peace of Mind for only 81 cent per day. Sign up in January and get 14 months for the price of 12. For more information visit www.frsfarmrelief.ie/membership or call FRS Roscrea on 0505 21166 or FRS Cahir on 052 7441598. Text FRS MBS plus your name and address to 51444 for a call back. Rain and warm humid weather are ideal conditions for the development of infectious diseases during these summer months. Worm infections in particular are widespread. As summer progresses calves eat more grass and the risk of infection rises. Stomach worm can cause up to 50% loss in performance. It’s vital that the health of a farmer’s stock is constantly treated for worms. Stomach worms are present as larvae which have survived from the previous season and others arise because they are passed through the gut of a cow. Calves which have not been exposed to this infection before have no immunity, so the larvae multiply in their stomachs. This leads to the spread of infection very quickly. Animals will be up to two years old before full immunity develops. Although cattle develop resistance over time, dosing for all animals is still usually required around July. HOW BEST TO TREAT THE ANIMALS? There are an enormous range of products on the market to treat worms in animals – ranging from the oral dose, to the injection, to a pour on or bolus. It cannot be said that any one product is better than another, but the longevity of activity against worms can vary in the type of product used. The white wormer that is orally dosed is probably the cheapest form of treating cattle with worms, but it also has the shortest activity length against worms. The many Ivermectin injections have various activity lengths and price wise, per animal, are slightly dearer than a white wormer, but are effective. Pour ons are again very effective and are extremely easy to use especially from a labour point of view. Weather may be a problem when using a pour on as a few hours of drying are required after application to allow it to soak in. Finally, a bolus can be given to stock orally, which is lodged in the animal’s stomach where it remains slowly releasing and killing worms during the grazing period. It’s a once off dose which, from a labour point of view, makes it very attractive, but is more expensive than any of the other forms of treating animals. Some older stock on the farm will benefit from a worm treatment at this time of year, namely yearling stores and in particular suckled yearlings, who would not have been as prone to worm infestation in their first year of growth.. Cows in general this year are showing more signs of worm infestation with persistent coughing been remarked by many farmers. If such is to be heard in your stock it is advisable to treat the herd. It may seem strange to mention Fluke at this time of year as we associate treating animals for fluke infestation during the late autumn and winter months. However if you happen to kill any animals in the factory over the coming weeks it is worth noting on the factory sheet return has the factory indicated whether fluke was active in any of the animals that were killed. We sometimes naively believe that because we dosed an animal maybe once over the winter period that all the fluke have been killed off in that animal. Unfortunately that may not be the case and if any few have been left behind they can multiply very rapidly again. It is estimated that €90 million is lost in the irish agricultural industry each year due to the presence of fluke. When routinely treating for worms throughout the summer it may be well worth while treating at least once during that period for fluke as well. WHAT IS THE CORRECT DOSAGE TO GIVE? All animal dosing products provide details on how much product to give an animal with regard to the weight of that animal. The hardest part from a farmers point of view is estimating the actual weight of the animal they are about to treat. The FRS cattle weighing service can be very helpful as it gives accurate animal weights and is an indicator of how animals are performing. Keep safety in mind at all times when dosing. Safe handling of the animal, the product one is using and the safety of the operator are important. Ensure facilities are stock friendly and secure. Wear protective clothing when handling dosing products and dispose of used product needles etc. in a safe and environmental friendly manner. From the operator point of view – don’t take chances – what might appear to be a very quiet bucket fed calf could have a very strong kick. FRS Cahir have a wide extensive range of animal wormers at very competitive prices. We can also chat to you about what product may best suit the stock you wish to treat and what’s of best value. FRS have a very experienced team of operators to assist you when dosing and handling livestock. 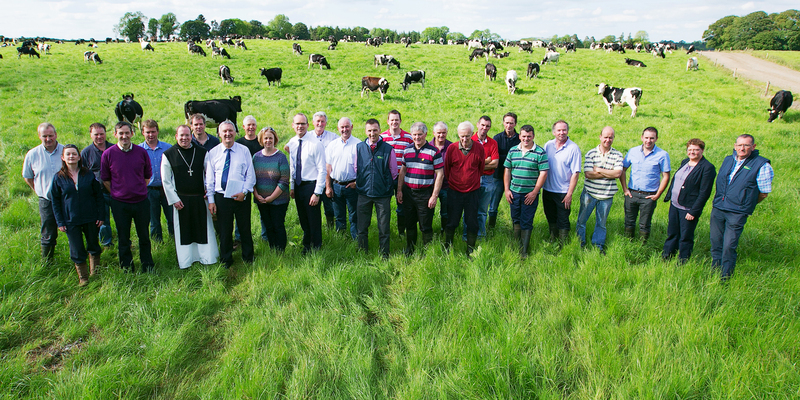 FRS (Farm Relief Services) launched the “Best Practice in Milking” course in conjunction with Teagasc and AHI (Animal Health Ireland) in July of last year. The course itself proved to be a complete success. Almost four hundred farmers have upskilled their milking practices through the course and are currently in the process of receiving their highly commendable FETAC/QQI level 6 certifications. Participants had positive feedback to give about the course. From beginners to the utmost experienced, each participant had something great to say about the course and the way in which it was taught. Some even admitted that milking all your life does not necessarily mean you know everything about it, “I have been milking all my life, didn’t think there was anything I didn’t know! But I was wrong AGAIN”. 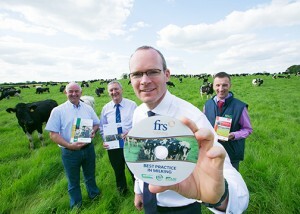 Minister for Agriculture, Food and the Marine Simon Coveney TD, officially launched the milking course last year on behalf of FRS, Teagasc and AHI. At the launch Minister Coveney said; “By improving standards and improving current farming practices through this milking course will help take the industry to the next level and to where we need to be in order to provide the best practice efficiently and compete on wider international stage. The department is backing this course through its funding and encourages farmers to upskill their current practices and new entrants to put the best foot forward and complete the course”. The course is suited to all level of expertise. Some of the previous participants felt that the course should be compulsory for those new to dairy. “Excellent course. Should be made compulsory for new entrants”. Every area of the milking routine is covered throughout the duration of the course including; Preparation for milking, Machine parts/components, Milk quality (SCC&TBC), Mastitis prevention, Washing routines, Animal diseases, Health and safety and many other essential aspects to ensure an efficient dairy system is in place. Undoubtedly, the course itself is extremely unique as it brings together the theory parts of milking and also the practical implementation of the theory. A customised DVD aids the delivery of the course and acts as a reference guide in the future. All course tutors and directors have been specifically trained and course content approved by the experts in the area of milking. Past participants were enthusiastic and highly recommended farmers to do the course, “I would recommend to all farmers because you would learn so much and “All farmers should do it, excellent course”. Plans are currently under-way for the next tranche of milking courses, which are due to commence this coming July 2015 and will be running throughout the country. 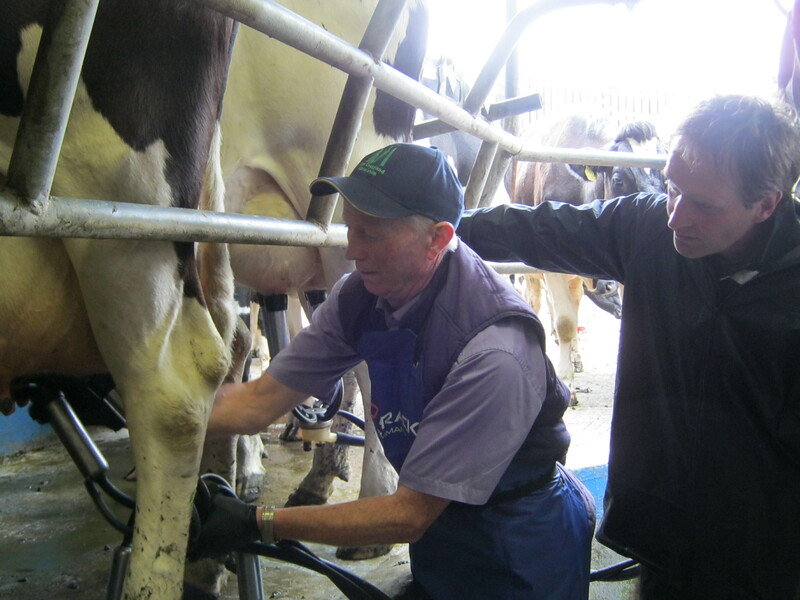 The course is open to all levels of milking experience from new entrants and people interested in relief milking to experienced dairy farmers. Currently the cost of the course is €250, reduced from €500 due to a €250 department subsidy. With the success of last year’s course FRS, Teagasc and AHI hopes that this year will be as successful. Visit www.frstraining.com/milkingcourse, alternatively call 1890 20 10 00 or Kevin Fitzpatrick at 086 0280450. Drop us an email at info@frstraining.com.